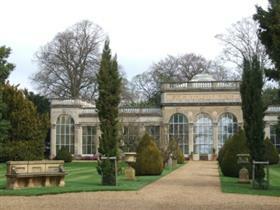 Castle Ashby is just a few miles from Olney. The house is not open to the public but 25 acres of grounds are...offering you magnificent park surroundings landscaped by 'Capability' Brown, who also built the temple. There's a small menagerie with meerkats and marmosets, plus a climbing frame so children will enjoy the trip too. The cafe at the end offers plenty of seating outside. The rural shopping yard at Castle Ashby is nearby.